Capture anything - a small region of your screen, wide panoramic scrolls, infinitely scrolling webpages, and more. Communicate your message. Modify and annotate your captured content with the built-in editor. Change colors, add shapes and arrows, blur text, highlight, and more with over 50 easy to use tools. Share instantly. Directly paste your creations into presentations, or upload to email, FTP programs, social media platforms, and more with 18 integrated applications. Quickly extract the text from your screenshots. Easily copy information from webpages, programs, or your desktop without retyping all the text. Toggle to automatically make objects in your screen captures movable. Rearrange buttons, delete text, or edit other elements in your screenshots. Change the words, font, colors, and size of the text in your screenshots for quick editing without having to redesign the entire image. Capture wide, horizontal scrolls, infinitely scrolling webpages, and everything between. Move objects or remove image backgrounds. Perfect for fast image edits. Turn any short screen recording into an animated GIF. Show off quick tasks and workflows. Toggle between webcam and screen recording during video. Add a personal touch. Call attention to an important item in your screen grab. Add captions, headings, or other text to an image. Callout includes an annotation plus text. Remove unwanted areas from the edges of an image. Highlight specific parts to show important details. Flood-fill a flattened area in an image with another color. Zoom in to show people what exactly you`re seeing. Quickly document steps and workflows with a series of numbers or letters. Personalize your images with stickers specially designed for screenshots. Delete vertical or horizontal sections out of an image and join the two pieces together. Draw freehand lines on an image. Easily highlight, cover, or add parts to an image so you can communicate with ideas. Hide or mask sensitive information in an image. Add a straight or curved line to an image. Your screen captures are automatically saved to your library saving your time. 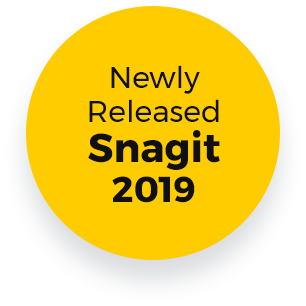 How can Snagit help you? Make training and marketing materials and share information easily. Record Skype sessions, webinars, and other online conferences. How many licenses does Snagit come with? You can install your license on up to two computers for a single user. For example, you can install on a desktop and a laptop or at home and at work. If your computer crashes or you get a new machine, you can reinstall the version that you purchased, as long as you don't have the program installed on more than two computers at a time. How do I find my software key? "Snagit makes it easy for us to empower colleagues across the company to share their personal knowledge with others." Copyright © 1995 - 2017, TechSmith Corporation, All Rights Reserved.